Circle Star Land & Cattle Co.
December 13, 2014, Las Vegas, NV. 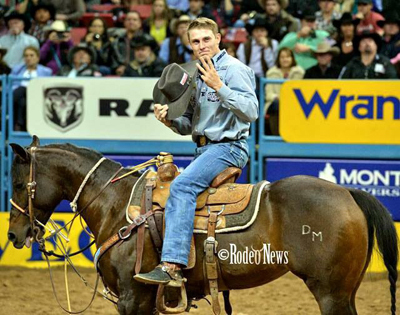 Tuf Cooper and Topaz win the NFR Rodeo in Las Vegas, Nevada. At age 24, Tuf Cooper, a five-time NFR qualifier and son of PRCA hall of famed, Roy Cooper, riding Topaz (Big Smokin Otoe, owned by Circle Star Land and Cattle Co., Pontotoc, TX) were the money leaders and the air to beat going into the National Finals Rodeo. Tuf and Topaz didn’t disappoint; they placed in three of the ten rounds, won a round, and won the average - all of which, along with their lead going in, propelled them into first place and the world championship. After winning the 8th go at the NFR, Tuf poses with (L-R) Josh Harvey, DVM, James Barton (Topaz’ trainer), Tuf Cooper, and Sheila and Cecil Rhodes of Circle Star Ranch, Topaz’ owners.